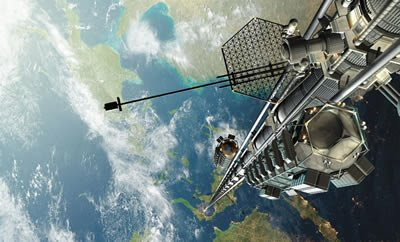 The concept of the space elevator has been around for a long time. Arthur C.Clarke helped awareness of the idea in 'Fountains of Paradise' published way back in the 1970's. And now the Japanese claim to be doing the development work prior to actually building one. Price tag claimed? $10 billion. I suspect it will cost a bit more than that, but its great to see a real start at last. Here's hoping they stick to their resolve, because it will be a tough job. It has so far cost the US around $5 trillion to conduct its war on terror. Benefits gained? One dead dictator and stuff-all else. Other effects: An unlimited supply of hatred for the US from the Muslim bits of the world. Well done, Dubya. Now, if the US had spent just one fifth of the money they have plowed into endlessly thumping Iraq and Afghanistan on developing space elevator technology instead, they could have built one hundred space elevators, rendered conventional spacecraft unnecessary and delivered payloads into orbit at a fraction of the present cost and opened up the Solar System. I wonder which would have been better value for money...? Have you read David Gerrold's "Jumping Off the Planet"? It involves the race by a family to be in the last elevator car to leave Earth, following ecological disaster, before the elevator tethers are to be permanently disconnected. One of my favourite SF novels. He followed it with two sequels, "Bouncing On the Moon" and "Leaping for the Stars".